Heavy defense spending and economic non-cooperation between India and Pakistan are detrimental to the welfare of the citizens of the two neighboring countries, argues a report released by the Atlantic Council’s South Asia Center on Thursday. At a briefing and launch of the report, India and Pakistan: The Opportunity Cost of Conflict, Authors Shuja Nawaz, director, South Asia Center, Atlantic Council and Mohan Guruswamy, nonresident senior fellow, South Asia Center, Atlantic Council, lamented that South Asia is the least economically integrated region in the world, mainly due to lingering territorial and political conflicts between India and Pakistan. This conflict has not only posed huge military expenditures on both countries, but has also significantly hampered economic cooperation. 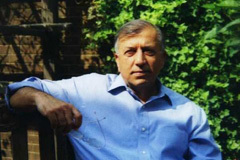 Guruswamy, speaking from New Delhi via Skype, maintained that the cost of economic non-cooperation was far greater than the military expenditure born by the historical rivalry. Guruswamy mentioned examples of China and Japan, India and China, Russia and the United States, and other countries who maintained trade and economic relations despite territorial conflicts and political differences. The volume of indirect trade between India and Pakistan was around $18 billion, while direct trade remained at just $2 billion. Guruswamy argued, economic cooperation will lead towards increased direct trade, which will in turn benefit the two countries and save them from freight and transportation costs. Citing research studies conducted by two eminent economists, Pervez Hassan and Shahid Javed Burki, Nawaz stated that had Pakistan reduced defense expenditures between 1970 to 2010, it could have added 2-2.5% yearly growth to its Gross Domestic Product (GDP). India could have seen a similar rate of growth had it opted to decreased defense spending, Nawaz maintained. Highlighting potential areas of trade between the two countries, Guruswamy said that New Delhi alone could import 300 trucks of fruits and vegetables from Pakistan on daily basis, and India can replace a number of electronic items at half the price that Pakistan was spending on imports from distant countries. Moreover, India and Pakistan can take several steps to build confidence and trust on both sides of the border that will lay the foundation for greater economic cooperation. Both countries should increase the distance between land forces deployed on their respective borders. More channels should be provided to strengthen people to people relations, and militaries on both the sides should engage in direct communications, such as through exchange visits. The two countries should jointly invest in energy, water, and export industries, and borders should be opened for trade. Nawaz maintained that opening the border for trade will eventually lead to greater ease in tourism visits. A report released today by the Atlantic Council’s South Asia Center argues that heavy military spending in India and Pakistan has in fact been detrimental to the citizens of both countries in terms of security and economic growth, and calls on leaders to reinvest in trade and confidence building. 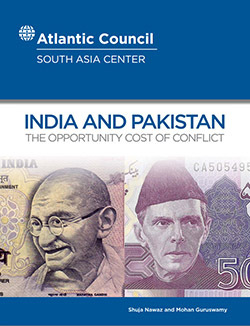 In India and Pakistan: The Opportunity Cost of Conflict, Atlantic Council South Asia Center Director Shuja Nawaz and Nonresident Senior Fellow Mohan Guruswamy explain how high defense spending and low economic integration into South Asia’s regional economy have come at the expense of those living in poverty. Although many now favor rapprochement, Nawaz and Guruswamy argue that unless both sides begin a dialogue on economic and military relations, these issues will only worsen. The Atlantic Council is a nonpartisan organization that promotes constructive US leadership and engagement in international affairs based on the central role of the Atlantic community in meeting today’s global challenges. For more information, please visit AtlanticCouncil.org and follow us on Twitter @AtlanticCouncil. Also speaking at the event, Haroon Ullah, member of US Secretary of State John Kerry’s Policy Planning Staff, directed attention to three such myths about political Islam, each preventing better governance in Pakistan and a stronger relationship with the United States. Firstly, violence is strategic. Political Islamists utilize violence as “very powerful signaling mechanism” to instill fear and meet their goals, which include securing votes. Secondly, democratization does not necessarily lead to moderation. The winner-take-all system in Pakistan’s elections enable smaller parties to hold a disproportionate sway in the country’s politics, as they often serve as the swing vote between major parties. In fact, Ullah argued, Islamic parties “stay stronger by staying smaller.” Islamists recognize and exercise this role—they are driven by pragmatism, rather than ideology alone. Lastly, poverty does not drive militancy. Instead, Ullah urged policymakers to pay attention to the thin middle class, often a target recruitment constituency, consisting of relatively urban, educated individuals. South Asia is currently witnessing the “largest democratic event in the world” with 7 million, or 60% of registered voters, visiting the polls in Afghanistan last weekend, and the first wave of 815 million registered voters begin to vote this week in India’s five week parliamentary elections. South Asia Center Director Shuja Nawaz and Senior Fellow Mohan Guruswamy reported on the region’s momentous events from New Delhi, with Deputy Director Bharath Gopalaswamy reporting from Bangalore. Similar trends are expected over the course of India’s five week parliamentary elections. Half of the registered voters are estimated to be below the age of twenty-five and nearly 114 million are new voters since the last election in 2009. For the first time, Guruswamy notes, “we might see women outnumber men in most constituencies.” This is particularly significant considering women vote for different issues. Where men tend to vote with their heart, women tend to vote for issues like water and schools for their kids. “2014 could be as transformative [for India] as 1989,” Gopalaswamy argued regarding the weight of this election. “People are expecting some kind of momentous change.” Despite, the ruling Congress Party’s achievements, they are always considered to be on the defensive, struggling to maintain support and to deflect charges of corruption from the opposition Bharatiya Janata Party (BJP). Gopalaswamy attributes this to Rahul Gandhi, who many consider a disappointment. In fact, Congress’s true goal, Gopalaswamy argued, is to simply “win a sizable number of seats in the party elections to convince patrons the Congress Party is worth [their support].” Focus has shifted to the BJP, who are widely expected to do well in the election. With 272 seats required for a majority, no matter the leader, the winner of the election will likely require a coalition to govern. However, if poll numbers and predicitons become reality, a large BJP seat count will result in a strong BJP government that will “make it difficult for [other] parties in the years to come” Gopalaswamy states. Though the coalition building process may have already begun behind the scenes, the election results will be announced on May 16, followed by the building of India’s new government. Demographics have played a huge role in the transformation of Afghanistan into a member of the democratic states of the world, according to Shuja Nawaz, the director of the Atlantic Council’s South Asia Center. “The Afghan people appear to have won another round with the Taliban and against the forces that want to derail the progress achieved by them – despite heavy odds – over the past decade plus,” Nawaz said. Despite the Taliban’s threats of violence, some 60 percent of eligible voters in the country turned out for a presidential election on Saturday. According to preliminary estimates, 7 million ballots were cast at 6,000 polling stations across the country. In explaining the country’s move towards democracy, Nawaz cited the youthful population “that is connected to each other and to the world” as well as increasing urbanization and the growing market economy, despite official sluggishness and corruption.